Before coming to the Nashville Farmers’ Market, Matthew Bass was selling about 20 trays of micro greens per month. Today he’s selling about 250-300 trays per week. 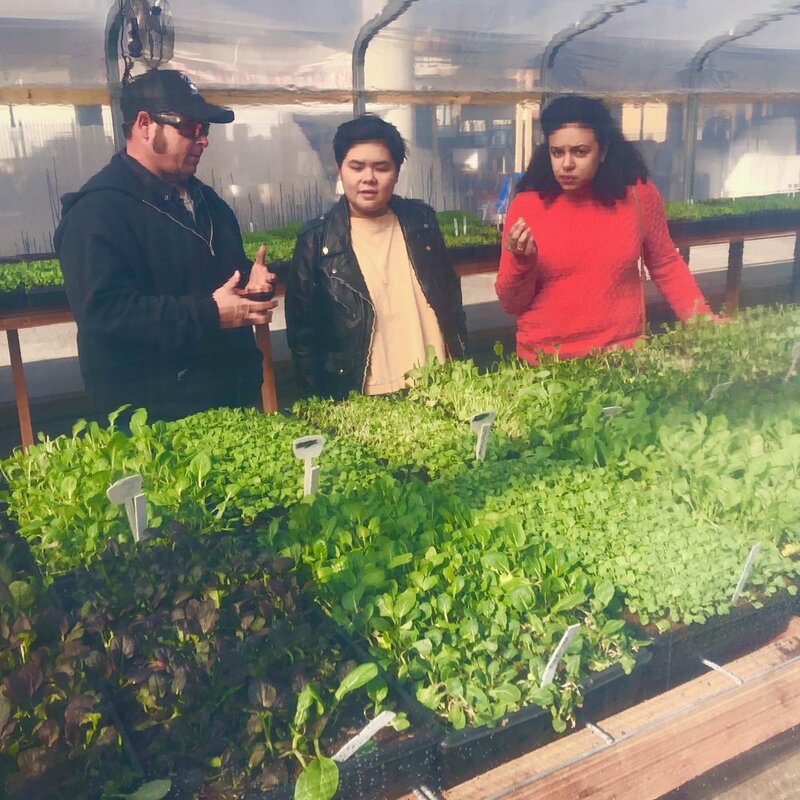 Matthew Bass of Bass Farms helped transform the Market earlier this year when he constructed a greenhouse for growing and selling his microgreens on-site (read more about the NFM’s “urban farm residency” program). We checked in with him to see how things are growing. What the heck is a microgreen and why do people buy them? I get this question a lot. Microgreen refers to the first two-leaf stage of a plant. Most of the plants we grow look identical until they put on their first set of true leaves. The nutrient content at the microgreen stage is far greater than it is at maturity, and the flavors can be stronger at the earlier stages. People are always looking for fresh, nutrient-rich foods, and microgreens and baby leaf greens fall in those categories. How did you come up with the idea of building a greenhouse at the Market? Last fall I asked if I could build a small greenhouse in the corner of one of the Market’s Farm Sheds just to house the greens when I was here on the weekends. The cold winter days can easily burn the microgreens. With the help of Market Director Tasha Kennard, that project quickly turned into the idea of building something much larger that would give us the ability to grow on-site as well. Bass Farms offers some 40 varieties of microgreens. How has this Market greenhouse changed your business? So far the extra space is allowing me to have more products on hand each week and not sell out so quickly. Since we are growing some crops onsite, customers are now able to see the plants at different stages of growth. Do you eat microgreens every day? What are your favorites? Although I don't eat them with a meal every day, I am constantly sampling them when I'm in the greenhouses. I like to see what the flavors are at different stages of growth. It's hard to pick a favorite, but red giant mustard, cress and snow peas are always good. My mom has always said that bonsai is mean to trees because it stunts their growth. Isn't that what you're doing to your veggies? Well, I have been told numerous times that they’re too cute to eat. Luckily, though, we can get multiple cuttings on most varieties… so I guess they are getting a second chance. What do you recommend to first-time buyers? Since we cut them fresh here at the market, you should always taste them first. I try to point out some with a more neutral flavor and then add in the spicier and more fragrant ones. We currently grow about 40 varieties of micros and baby leaf greens, so it can be overwhelming to pick out your favorite. Now that you’re no longer under a Farm Shed roof, how will you keep from melting out here in the summer heat? Still trying to figure that one out. But luckily we installed a shadecloth last week and the sides of the greenhouse will come off May 1, so that should help keep it a little cooler. You give samples. Good idea ... but has anyone ever asked for enough samples that they simply got full and left without buying? Not yet, but there was an incident last year when someone started grabbing handfuls of plants and soil. Thankfully another farmer and NFM security officers stopped her. She’d misinterpreted the “Free samples” sign. Have you ever considered aquaculture? You could call it — wait for it … Bass' Bass! What do you enjoy most about selling at the Nashville Farmers Market? Getting to meet new people every week who share common interests in how food is grown, while at the same time introducing our products to people who have no idea about microgreens.